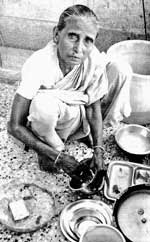 This is Lakshmi Panda, a 77-year maid servant who’s been washing dishes and sweeping floors for the past many, many years who has the temerity to say that she now feels all that she did for the country was a waste. Hah! The sheer audacity of this woman. After all, who is she that she can make this statement? She fought in the INA, yes, Netaji Bose’s Indian National Army in the Rani Lakshmi Bai Regiment under Capt. Lakshmi Sehgal. So what? Does she not know that Bose and the INA never got us freedom from the British? It was Gandhi people, Gandhi and Gandhi alone that got us freedom! The INA was just riff-raff cobbled together by a disgruntled congressman who disagreed with the great Mahatma’s opinions and ideas. While Bose said, “My enemy’s enemy is my friend.” Gandhi said, “My enemy’s enemy is my enemy too!” Anybody with a bone of common sense can see who was right. Bose wanted to drive the British out of our country. Gandhi requested them to…please leave… And Gandhi won in the end. Sacrifice is the greatest ideal. And millions of our countrymen were sacrificed at the altar of Gandhi’s views, dying for the British, fighting for the Englishman and his cause. If that doesn’t make Gandhi great, what does? Now, coming back to this maid servant, who thought she was fighting for freedom of her land. She hasn’t received her pension for the longest time. Making a living by working in others houses in the great Republic of India. She thinks she deserves a pension. But the Centre doesn’t. Their criteria is different. She isn’t a freedom fighter because she didn’t spend any time in jail. Now, that’s one hell of a definition. Clear. Concise. And no, prisons and hell-holes like the Cellular Jail might not count. There you go. That is why she doesn’t get any pension. Anyway, why ‘spend money’ on living freedom fighters who can anyway take care themselves? Think dignity of labour people!, even washing dirty dishes is a job! We’re better off not squandering our money way on these people with delusions of being patriotic when we can spend millions trying to get hold of the Great Mahatma’s handwritten manuscripts. After all, we got our independence because of Gandhi and Gandhi only. Ok. Ok. Nehru too. Yeah and some other random people. So given a choice between invaluable and priceless pieces of paper written on by the Great Man and people who gave their all to this great nation, who would you choose? Of course the manuscripts. You can laminate them and put them up for display at museums that tell us how Gandhi single-handedly won us our freedom. People, like Lakshmi Panda, will soon be dead anyway, and there’s no way you can put her on display. After all, with the sixtieth anniversary of our Independence from the British coming up, acquisition of handwritten manuscripts make for better new stories, glamorous discussions, and opportunities to show more footage of The Great Gandhi than some old unglamorous shrivelled hag who thought she was being patriotic. And isn’t that the difference between patriotism and Patriotism? Media coverage and good PR? Very nice piece of info, man. All my sympathies with the woman and unlike Midday and all b**** media floating around these days, The Indian Express once did a series of articles on such forgotten freedom fighters and set up a fund to help them. I don't quite understand the anti-Gandhi sentiment in this post though. Why drag Gandhi into this? Its not his fault that this woman is suffering. I've read my history too and it just seems that Gandhi, like a lot of other famous people was hated by a bunch of folks only because he was so popular and successful. His major role in the freedom movement is undeniable and it is totally foolish to try and undermine his efforts in any way. There might be others who (in some opinions) were more important to the freedom struggle but that in no way creates grounds for disrespecting M. K. Gandhi. Shall be hopping onto your blog every now and then. I like reading blogs by people who have crisp and clear opinions of things and not just go-with-the-flow type of content. and Yeah. It's not Gandhi's fault. We hear that a lot don't we? anyways, i have no love lost for that man, but yes, i will not deny that he played a role. but what i take exception to is the condescending attitude taken to all others except him and the general feeling given that it was him and him only. which even you know isn't true. as far the fact goes, that people hate gandhi for just being popular and successful, no i don't agree as the reasons for my dislike of the man goes deeper than that. so attempts are not to undermine his 'efforts', but to draw attention to what those 'efforts' led to, and what they gave root to in this country. to bring to light all the things that the mainstream media and sychophantic historians skip and delete. anyways, thanks for dropping by, and keep hopping in. and yes, your 'peace with guns' kinda reminds me of a joy division line. "...A loaded gun won't set you free." so you say. that's how the line ends. missed that in my hurry. "...A loaded gun won't set you free. So you say...."
What is Joy Division anyway? I could do a Google search for it but I don't wanna put up any pretensions of knowledge. There you go into my ever-increasing blogroll!